The National Trust is a charity dedicated to preserving the cultural, historical and environmental heritage of the UK for everyone to enjoy. 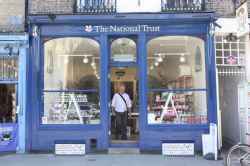 Based in Kings Parade, Cambridge, National Trust is a charity shop. National Trust is in Kings Parade Cambridge. You can view a list of neighbouring businesses by going to the Kings Parade page. Note: the pin is positioned at the postcode centre, and may not correspond with the precise location of 9 Kings Parade.